I found this in my research of resonance and waves. I find it very interesting how waves and resonance manifest themselves in so many different ways. Instruments resonate, and the resulting harmonics develop rich sounds. In the video below, undular bore waves compress moisture into clouds that sweep across the sky. 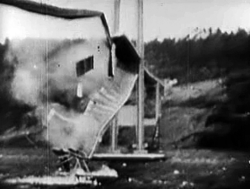 The Tacoma Narrows Bridge disintegrated under a 40 mile an hour wind. The Chladni phenomenon creates intricate patterns in sand from simple single octaves.